Enduring craftsmanship…every cabinet knob, drawer pull, hook or fixture we make at Top Knobs is crafted following a rich tradition of quality and attention to architectural detail. 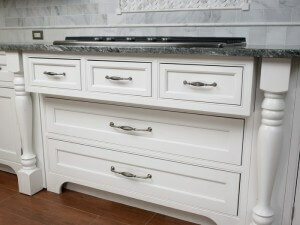 You can feel it in the weight of our cabinet knobs and see it in the character of our hand-finished designs. Our completely sealed finishes ensure our knobs last for decades, so you don’t see wear on the cabinet knobs and drawer pulls you use most. That’s why we confidently offer an exclusive lifetime warranty for the original purchaser. Top Knobs has a product line of over 3,000 kitchen, bath and closet knobs and drawer pulls to match your individual style and décor. 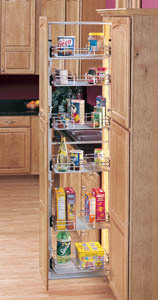 Our Product line began as metal and polymer Lazy Susan components manufactured for the largest U.S. cabinet manufacturers and has grown into the market leading innovator of quality, functional residential cabinet storage and organizational products such as Lazy Susans, Kitchen Drawer Organizers, Base Cabinet and Pantry Pull-Outs, functional Waste Containers and Childproof Locking System. The product line currently consists of polymer, wire, wood, and stainless steel components, manufactured and marketed globally to Kitchen Dealers and Furniture Manufacturers, Cabinet Industry Distributors, and Retail Home Centers. Rev-A-Shelf Europe markets and distributes from a distribution center in Le Balmay, France. A “whole home” approach has expanded the current product categories to include: kitchen, bath, closet, and childproof cabinet products targeted toward the middle to luxury end of the customer demographic. Handcrafted Copper kitchen sinks for extra designer appeal; Bathroom sinks including handcrafted Copper and Brass Vessels and both surface and undermount vitreous china sinks. Faucets. dispensers and sink grids to compliment whatever style of sink you choose. We are pleased to present this collection of our latest offerings and will continue to work to offer the highest quality products we can, meeting our customers’ needs for quality, performance and aesthetics.